On December 10, 2010 over a luncheon at the Great Wall Restaurant in Phoenix, a further important step towards the opening of this new affordable housing for the elderly occurred...for more details. click here. 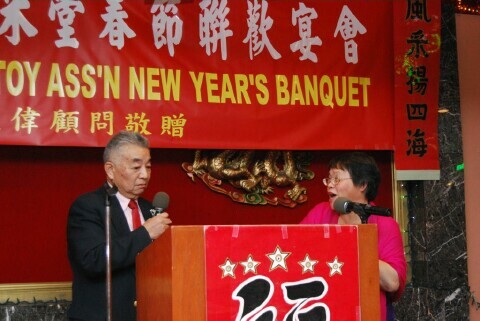 On March 5th, Saturday, the Phoenix Yee Fung-toy Family Association invited family and friends to the Great Wall Restaurant for its annual lunisolar New Year’s Celebration, with over 400 diners in attendance. Jack J. F. Yee welcomed all at the outset and was followed by the greetings of the season delivered by the current Association President, David M. Yee. The many distinguished local guests and community leaders were further highlighted by friends from afar – which no less than the Master K’ung-chiu declared was a pleasure to enjoy: in this case, the Western Region (USA) Grand President Larry Yee from San Francisco had arrived earlier by plane, and Alan and Edie Yee had driven in from Los Angeles. 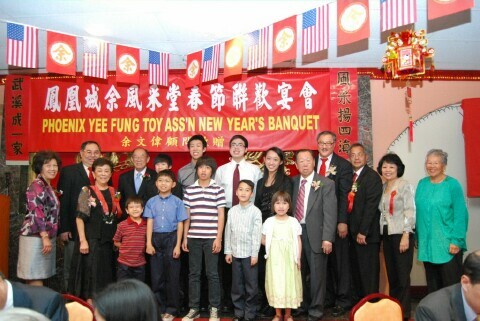 Alan bears not only the title of Western Region Grand Vice President, but also the World Yee Fung-toy Family Association Vice President as well. 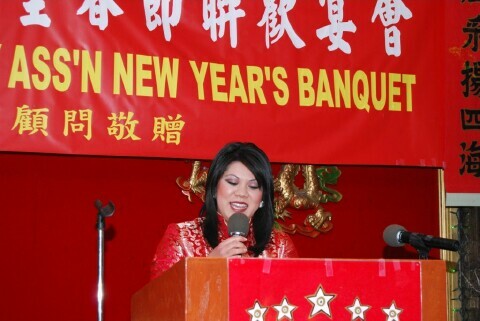 An invocation was delivered by Pastor Mack M. S. Yee of the Phoenix Chinese Baptist Church and then a sumptious eight course banquet was served, during which other elements of the program for the evening were conducted so as to ensure a lively time not overlate into the night. A special guest and greeting was from Kimberly Yee, a member of the State of Arizona House of Representatives, the first Asian-American woman to be so honored. Rep. Yee had served both in California (in the cabinet of outgoing Governor Arnold Schwarzeneger) and in California (for outgoing State Treasurer Dean Martin) and specializes in health, education, and women’s issues. A particular highlight was the performance by 12-year- old Jessie Lee on the ku-cheng, a zither, played with both sensitivity and vigor. 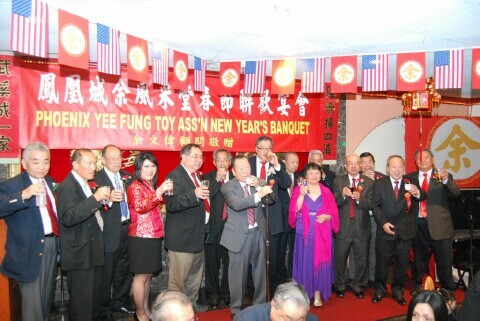 John M. Yee and officers and elders of the Yees toasted all assembled with New Year’s benisons and the fervent wish that next year, all would be present again after a year of good health and new wealth. Rudy Yee and Angie Yu were the Emcees of the evening, keeping up a banter in English and Cantonese that even included bilingual jests about the Year of the Rabbit. They introduced Gayle Yee, Kathy Yee, and Janet Yee to draw the gift certificates from the Great Wall Restaurant, New Hong Kong Restaurant, and World Buffet so that the festive dining can continue even after the evening’s repast. A most elevating note was afforded by the provision of Scholarship Awards. The Committee this year, as for several years now, has consisted of MaryAnn Yee, Jeanette Hing, Betty Yee, and Mayen Yee; each took turns introducing the awardees and describing their many achievements. At the level of elementary graduation, Aaron Yee (son of Mr. and Mrs. Paul Yee) was awarded. At the level of high school graduation, the winners were: Nathan Yee (son or Mr. & Mrs. Fred Yee), Thomas Wong (son of Mr. & Mrs. Arlen Wong), and Ariane Song (daughter of Mr. and Mrs. Jeff Song). 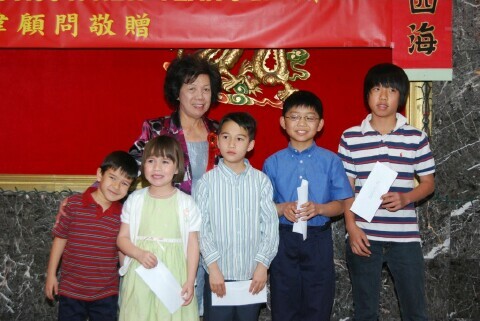 The Phoenix Yee Fung-toy Family Association also provides financial support for Chinese language learning at any of the Valley schools for this formal purpose, and thus four young students were honored this evening in that category. 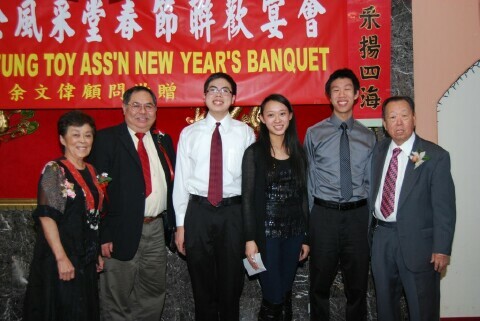 They were Nathan Yee (son of Mr. & Mrs. Harold Yee), Lauren Yee (daugher of Mr. & Mrs.Herbert Yee), Matthew Yee (son of Mr. & Mrs. Herbert Yee), and Derek Yu (son of Mr. and Mrs. Jin Xin Yu). Association Vice President Joe Yue wound up the noisy happy time by formally thanking all who attended for sharing this occasion with the Yee clan. Stephen Yee, youth minister of Northwest Phoenix Baptist Church, then offered a closing benediction and the Year 4709 was well-launched indeed. 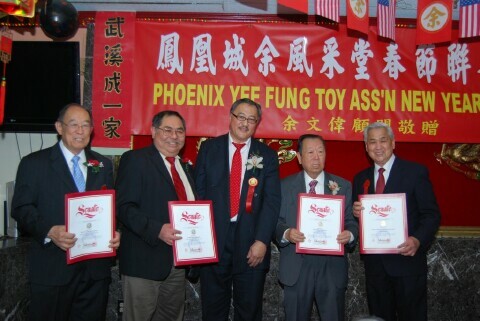 On Saturday, April 30th, the Phoenix Yee Fung Toy Family Association gathered at its Clan Hall to commemorate the 22nd Anniversary of its initial opening with a traditional festivity to honor the eponymous ancestor of this patrilineage. In the customary fashion of relatively modern ancestral veneration, which had roots in ancestor worship by the kings of the earliest dynasties for their royal deceased, rites were conducted before the supposed portrait of Yu Feng-tsai. 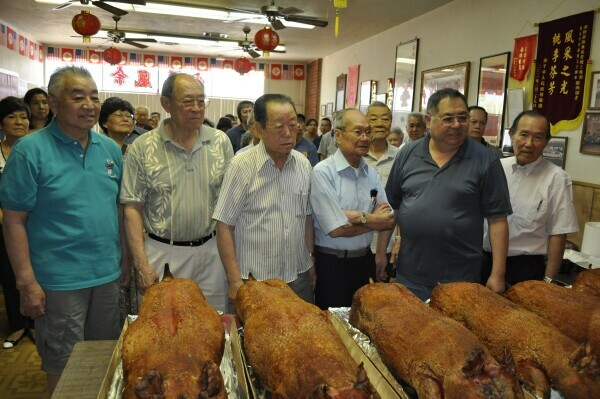 The salient aspect of those rites was the presentation of six whole roasted pigs (a style of preparation unique to the Cantonese of Guangdong Province), followed by an offering of incense, and a libation with whisky (substituting for the clear rice wine which was of course not very available to earlier overseas Chinese communities). These rites were implemented by Mr. Willie Yee, as Mr. Ken Yee intoned especially to the male descendants gathered in front the call to offer three bows of respect. Then, the six pigs were offered up both for the free luncheon on site accompanied by other entrees brought/bought by others, and topped off with a variety of desserts, as well as for distribution in generous slices to all Family Association members (with modest dues paid). The operation to butcher, to serve, and then to clean up and restore the Clan Hall to its normal status as a meeting facility involved many hours before and during and after with many hands and a spirit of cooperative unity and familial good cheer. This year, the record attendance was marked not only by an overfull parking lot at the 16th Street site, but also by the attendance of many business and community leaders of the general Chinese-American community. Their presence was accounted by all the Yee Family as a mark of great honor and was of course deeply appreciated. Mr. & Mrs. Kam Yi Yee, Mr. & Mrs. Doon Yee, Mr. & Mrs. Benny Yee, Mr. Edward Yue, Mrs. Jerry M. Yee and Mr. John M. Yee. 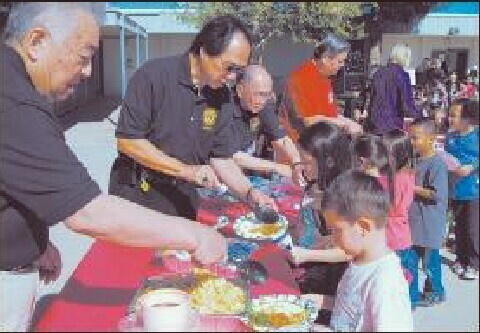 The current President of the Family Association, Mr. David M. Yee, had delivered welcoming remarks at the onset of this occasion, and he had made his donation of a roasted pig when the Chinese New Year rites were conducted to anticipate hopefully the Spring for which that Festival is named in Chinese parlance. By the time Roman Catholic missionary efforts were gathering steam in early Ch’ing, after pioneering efforts in the late Ming by the likes of Matteo Ricci, Westerners and Christians had had to try to discern what the customs of ancestral veneration came to mean. In the famous so-called “Chinese Rites” controversy, the Jesuits noted that Christians for over a millennia had well understood themselves that they worship God but they venerate the saints, with whom all Christians are in communion according to the Apostles Creed. These Chinese customs were just the manner by which according to Chinese culture, the Jesuits argued, respect was paid to ancestors by veneration: the Chinese by the 1600s were not “worshipping” their ancestors. Thus, the fate of the last prayer of Jesus Christ on the night before He was betrayed, which Christians remember in the Lenten season now leavened with Easter, that His followers might all be one as He and the Father were one… Yet, indeed, we Chinese are not much behind Christians for division and disunity looking at the broad sweep of history -- for China can be assessed to have been unified for only about 60% of her long dynastic record. All the more the hopeful note from the Hebrew scriptures – “how pleasant it is when brothers dwell together in unity” – can at least occasionally be manifested as it was among the Yees on April 30th. Rep. Kimberly Yee receives the 2011 Representative of the Year Award on June 24, 2011. Photo by Timon Harper. 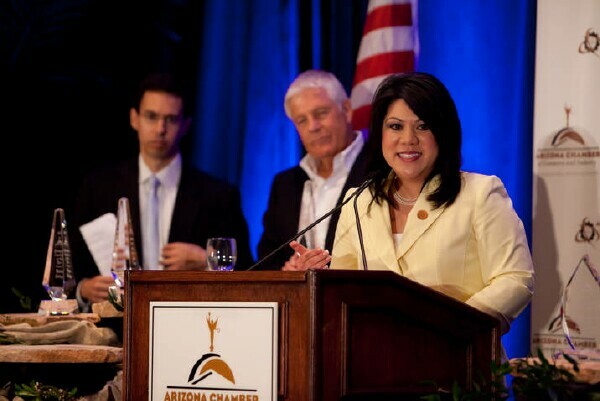 Arizona State Representative Kimberly Yee of Phoenix was honored with the 2011 Representative of the Year award by the Arizona Chamber of Commerce and Industry on Friday, June 24th at the Scottsdale Plaza Resort. The event was attended by over 500 individuals from Arizona’s business, manufacturing and political community, including Yee’s parents, Mr. and Mrs. Jack and Betty Yee of Phoenix. Upon accepting the award, Representative Kimberly Yee shared stories with the audience about her family’s history of business ownership. Representative Yee said her mother’s family grocery store was one of the first “mom and pop” grocery stores established in the South Phoenix area. Representative Yee then shared about her father’s family history in business. “My great-great grandfather first came to this country from China in the early 1900’s. He, like many great Americans, came here to have a better life, work hard, start a business from scratch, and live out the American Dream,” Yee said. “That is why it is such a privilege to work with the Arizona Chamber of Commerce because they stand up for the very things that make our businesses stronger. They, like all of us, want to keep the freedoms we have in a competitive, free-market economy that stands for personal responsibility in an environment free from government intrusion,” Yee concluded. Representative Yee authored two of the Arizona Chamber of Commerce’s capstone bills during this year’s legislative session, including H.B. 2423, which increased public scrutiny over the Attorney General’s office contingency fee contracts with private attorneys, and H.B. 2541, a bill that established protections for employers to take action against employees who are impaired due to the use of medical marijuana. Representative Yee was elected last November to represent Arizona’s Legislative District 10 in North Phoenix and Glendale. She serves as the Vice Chairman of the House Education Committee, and is a member of the Health and Human Services Committee and the Employment and Regulatory Affairs Committee. 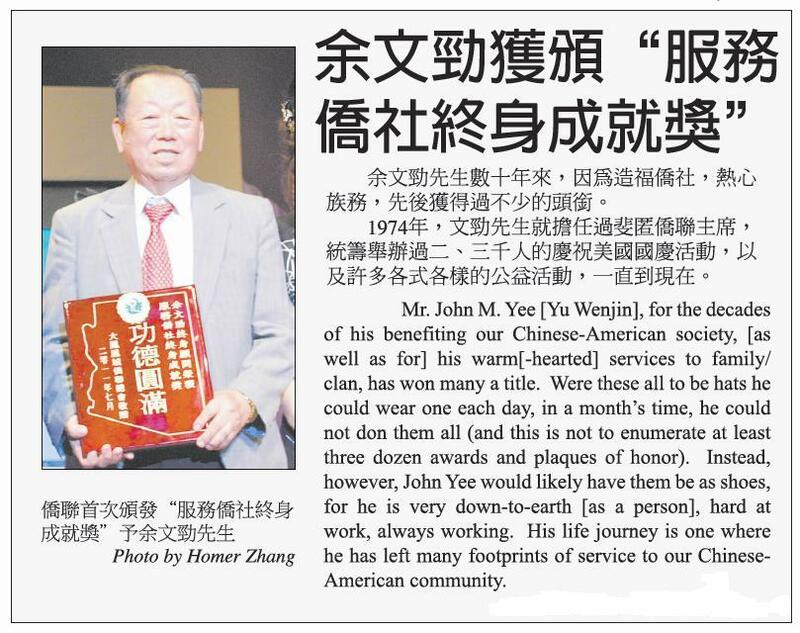 Mr. John M. Yee (Yu Wenjin), for the decades of his benefiting our Chinese-American society, (as well as for) his warm-hearted services to family/clan, has won many a title. Were these all to be hats he could wear one each day, in a month’s time, he could not don them all (and this is not to enumerate at least three dozen awards and plaques of honor). Instead, however, John Yee would likely have them be as shoes, for he is very down-to-earth [as a person], hard at work, always working. His life journey is one where he has left many footprints of service to our Chinese-American community. 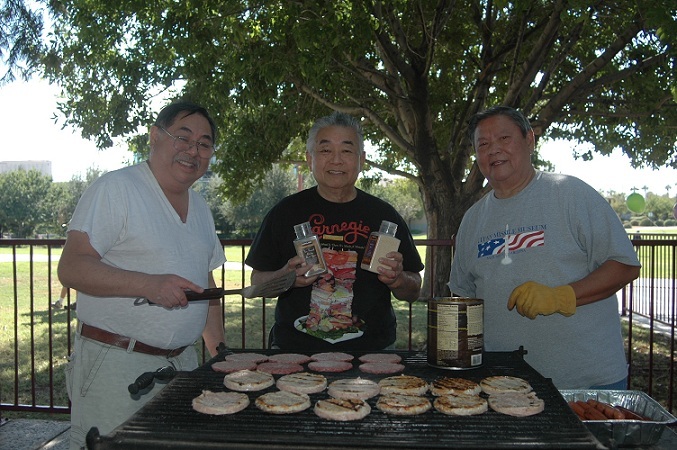 As early as 1974, John served as the chairman of the (then-named) Phoenix Chinese United Association (now the Chinese United Association of Greater Phoenix – CUAGP) and organized Fourth of July Celebrations attended by two, even three thousand, people, as well as many other successful activities, (that) continue to the present. 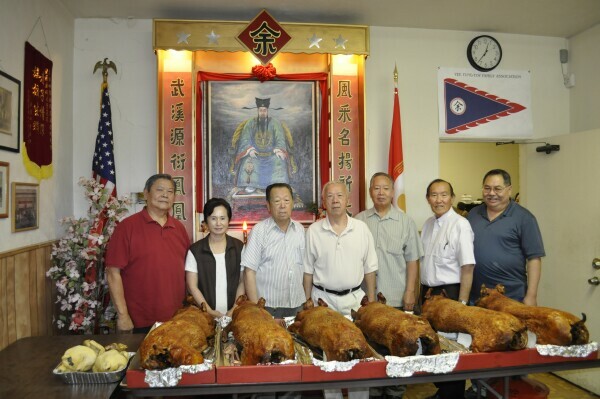 In 1978, John was among the founders of the Phoenix Chinese Senior Citizens Association, and one of the most generous donors (to this endeavor). In 1992, John felt that an area of recent burials for Chinese-Americans was both too close to a freeway (with noise day and night – in contrast to the traditional expectations for Chinese gravesites) as well as overly ethnically mixed. He coordinated with the Chinese Welfare Council and Greenwood Memory Lawn to establish a new Chinese Memorial Garden. (Moreover) at that time a half-price sale was arranged, with 200 plots sold rapidly, saving about $100,000. Thus, the concerns our community seniors for a century as to their final rest (arrangements) were relieved. 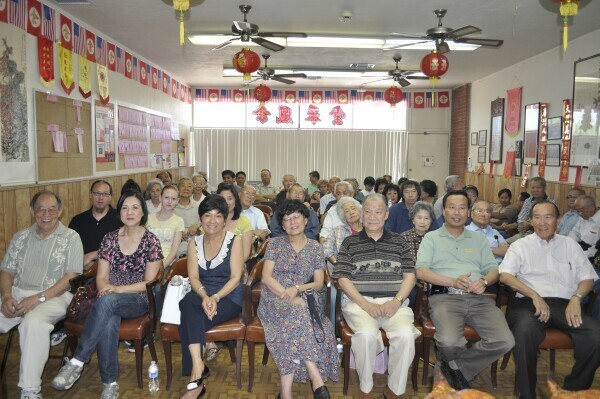 In 1997, as the population of Chinese-American seniors surged, and the facility for the Phoenix Chinese Senior Citizens Center was no longer adequate, John wrote articles in (both) the Yasheng Shibao (ARIZONA (CHINESE) NEWS) and the Jinshan Shibao (GOLD MOUNTAIN / (SAN FRANCISCO) NEWS) and served as the Fundraising Chairman (for this project) with personal involvement reaching the entire Chinese-American community. Nearly $300,000 was raised and the expansion of the Senior Citizens Center was successfully accomplished. In 1998, as (City of Phoenix) excavating (for sports arenas downtown) uncovered the first artifacts (of our early local Chinatown), John spearheaded a vigorous effort with 140 other Chinese-American community leaders (to place) a [commemorative) stone tablet (conveying their respects on site). From 1992 to 1997, John was both the editor and the pillar of the Yee Clan magazine in the U.S., the Fengcai Jiqian (Fung-toy Quarterly) resuming publication in Canada (as well). While in Hong Kong to attend a (Joint meeting of) Five Yee Clan Halls, John (received) shoulder-to-shoulder backing from these five to remit $1,000,000 US for a scholarship fund which will benefit the succeeding generations. In 2000 at the founding meeting of the World Federation of Yee Clan Organizations, John was elected a Vice President. Attending were two dozen traditional Clan Halls, branches from both Taiwan and the Chinese mainland, representatives of Hong Kong émigrés, the principals of six Chinese language schools – all told over 500 heads and leaders present to celebrate a grand General Assembly (of the Ancestral Clan). This was unprecedented. John M. Yee is concerned with proper family upbringing and due filial respect to one’s forebearers. In 1995 at the Taishan City (in Guangdong Province) Wuxi High School (which name commemorates the ancestral place of the eponymous founder/model of the Yee Clan, Yu Fengcai (1000-1065 CE)) John established a [Yu] Shiho Scholarship Prize (memorializing his patrilineal Grandfather), as well as a (separate) Yu Shiho Senior Center. In 2004, at his own alma mater Fengcai High School in Kaiping City, Guangdong, his donation of $40,000 US erected an ornate formal Gatehouse. In 2010, Mr. and Mrs. John Yee were enrolled in the Temple memorializing Yu Zhongxianggong [Loyal Assisting Duke Yu (Fengcai) – the honorific title of nobility conferred posthumously in the reign the Northern Song Dynasty Zhiping-era Emperor Yingzong] as among the famous/distinguished persons hailing from Kaiping City, Dihai District. John had already spearheaded a fund-raising campaign that provided $100,000 HK for fully refurbishing that Temple [to last for another century of splendor]. 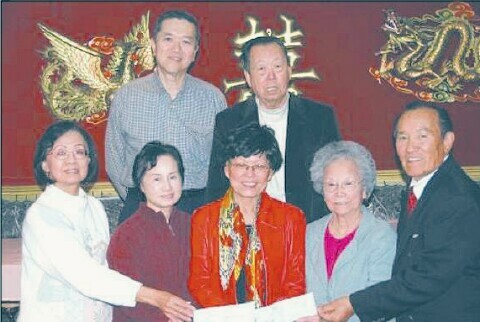 In 2011, at the happy completion of the Hong Lok House [Kangle Daxia] (for low income seniors), Mr. and Mrs. John Yee donated $10,000 US for the Pavilion to commemorate the maternal care received from his mother, Yu Huang Yueming, naming it the Yue Ming Ting [Moon Brilliance Pavilion] – once again impressively demonstrating filial gratitude and the spirit of the ancestral homeland. John Yee enjoyed a beautiful marriage; his wife, of the Ji family, had virtue and character. Together they labored in business for decades, lovingly supporting each other, and reaching to the “diamond” level of sixty years – in every way warmly complete and as well enthusiastically serving the wider Chinese-American community. In the life of a person with such a harmonious union, what more can be asked for? John Yee [not less] enjoyed a full and rewarding family life – a caring father with filial sons, a beautiful wife and mother to the children – together raising three sons whose success in schooling has been followed by the same in careers. Each [of them] in marriage has a son and a daughter – [truly constituting] three [Chinese ideograms/] words “good” – an envious [situation to] others. [Translator Note: the ideogram for “good” is a combination of the ideograms for “son” and “girl/daughter” as the Chinese text above illustrates.] An older generation like the spring sun or dewy rain to the next one, the sons and grandchildren respecting filially the parents and grandparents [veritably] precious: a family from top to bottom [whose] joy fills the air! In the life of a person with such an excellent family, what more can be asked for? John M. Yee regards others with serious concern and weighty principle, [yet, about him is an] air of amiability and good humor and calmness [all the while] he enjoys helping others and takes pleasure in resolving situations. With regards to the Chinese-American community, as with his dedication to the Yee Clan (which also benefits the wider community), he strives to win broad general support [for endeavors]. [Thereby] above he adds glory to his Yee Clan forebears, [while] below he fills [the generation of] children and grandchildren [with] benefits. In the life of a person with such brilliance in marriage, in family, in career, in merit fully [acclaimed], even more what more can be asked for? 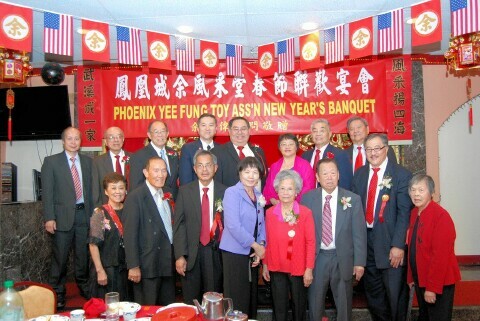 Mr. John M. Yee has been selected to receive the 2011 Lifetime Achievement Award for Service to the Chinese-American Community by the Chinese United Association of Greater Phoenix. It is well deserved indeed! 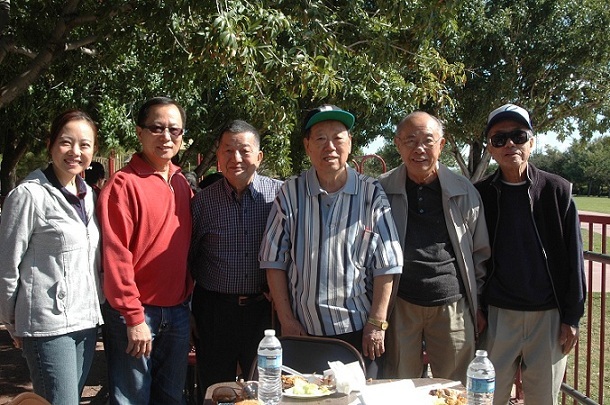 On November 6, Sunday, the Phoenix Yee Fung-toy Family Association gathered for our Annual Autumn Picnic. Beginning last year, thanks to the leadership of Association President, David M. Yee, who has served as the chief executive of the Phoenix Koi Club and also on the board of the Japanese Friendship Garden in the City of Phoenix Margaret T. Hance Park, the site for the event proved to be a major underlying factor for its success. The fenced space includes fixed seating and tables under spacious ramadas; the parking is ample and adjacent; the locale is the heart of central Phoenix, readily reached by expressway and yet in a quiet, long-established neighborhood; the facilities of the Park afford immediately available overflow space that is well-kept and grassy; and, free passes are available for participants to stroll through the beauty and meditative sanctuary of the Friendship Garden with its vistas, statuaries and accents, and even a waterfall to highlight its flowing streams bridged over but teaming with koi. 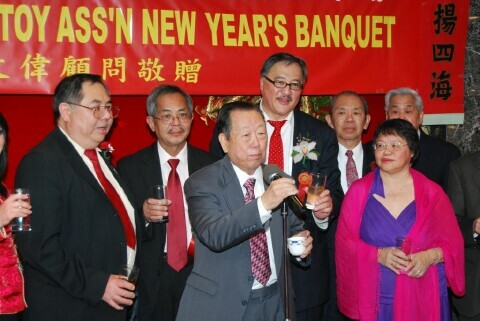 Another factor adding to the festivity is the invitation to the broader local Chinese-American community to join in – there were leaders from other associations, and from the bilingual media, as well as the personal friends of Yees. It goes without saying that for many years now, the Association has always invited all married Yee women to come, altering the old customary perspective ‘from the Old Country’ that a daughter after her wedding belonged to another household/family/clan and was no longer a Yee. We are, after all, Americans of Chinese descent and our freedoms include the chance to reassess and to improve on the old while not slavishly following the new. Naturally, every year, the informal setting, plus the advent of a season when the weather reminds us in Arizona of why we love to live here (the summer having thankfully passed), means the real hubbub of happiness emits with the scurrying and screaming kids who don’t have to be cosseted and closed in with formal seats at round tables in a crowded restaurant affair. The typical picnic fare of hamburgers, hotdogs, chicken breasts, veggie burgers, etc. with all the trimmings was of course elevated by Cantonese barbecue pork, stir-fry vegetable combination, and an array of both American and Chinese desserts from stores and home kitchens. Even with the ravenous hordes, leftovers remained to be distributed as well as the usual picnic accessories in drinks and coolers and extra tables and chairs to be hauled away. Like so many other events and activities, the adage that many hands make light work was demonstrated yet again on this day. So long as folks bear this in mind, the schedule of the Association, year by year, cannot be daunting but rather inviting for the good time, the good fellowship, and of course the good food that will be all brought together as we celebrate our ancestral heritages and our American blessings.